Those Milner women have been at it again. Surprise inter-continental visits, parties conjured out of nowhere, competitive belated birthday treats… my head is spinning. Mrs A called the first shots. At least I think she did. She had a fantastic time visiting her ‘Sis, Sue in Tenerife a couple of weeks back. As if temperatures nudging the high 30’s, ruby Rioja on draft and smelly cheese by the trowel-full were insufficient, Sue had also treated them to a splendid birthday stay in a top resort hotel by the coast. Everything on tap apparently. The only thing missing was Tony Blackburn hosting an edition of Seaside Special. But this time it worked perfectly. Granny was ambushed half way down the High Street. Our daughters were the advance, diversionary party. Granny greeted them effusively and then looked up and stared blankly at her émigré daughter for a good few seconds. And then came the scream of recognition. Closely followed by an open-palm thigh–spanking manoeuvre that has since become the template for a brand new Bavarian lederhosen stomp. The timing of Sue’s visit was party driven by the Eurovision Song Contest, which fell on a convenient weekend between holiday weekends and thus provided an excuse for a party. Much in the same way that, for this lot, returning a library book on time might. Eurovision’s tortured televisual marathon is a marmite test. You love it or loathe it. Half measures don’t work. But it’s tough love. In the way that screaming filthy abuse at the toothy, airbrushed mannequin from Latvia when they give another 12 points to Estonia is love. Or at least passion. Especially when the volley comes from Granny, over there on the settee, aged 80-and-three-quarters. The five girls were in charge of thematic party preparations, but ultimately led from the front by Sue. At the off, we had cheese from the UK, wine from France, tapas from Spain, cold meats from Germany, pickled fish from Sweden, pasta from Italy, salad from Russia, taramasalata from Greece, tsatziki from Turkey, and er, maltesers from Malta! 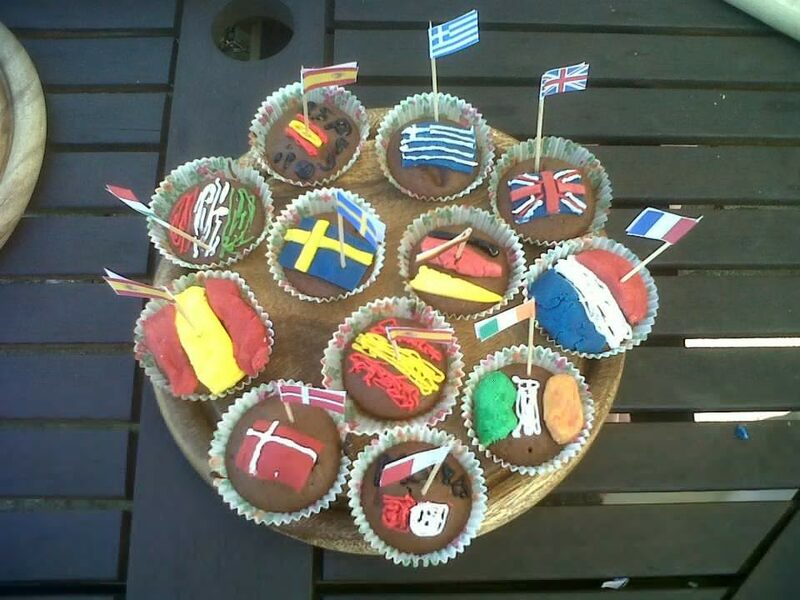 We had buns iced with nationalistic emblems, home made flags on cocktail sticks and highly dubious slogans like “Get Behind The Hump” splattered over pictures of the big man. Could a house be more thoroughly prepared? Dink makes a stink. Possibly. Sharon & Chris came down – more surprises – or had someone led this particular cat out of the bag already? And Callum & Julie arrived. We ate. We drank. We scored…the songs (obviously). We hissed at the Greeks for the debt crisis, roared at the Russian Grannies for their comic farce and booed the French for being French. And we winced at The Dink. Admittedly, he didn’t have the strongest of material to work with, but those missed notes and that lumbering delivery can’t have helped. Not that a heavenly tune composed in Elysium and borne on the very breaths of angels would have made a blind bit of difference to that Anglophobe jury. We won’t be winning this anytime soon. "Ah", said Granny. But at least we had the sweepstake to keep us edgy. Never let a betting opportunity go unexploited. That’s what I say. 26 finalists meant two blind picks each with enough spares to be allocated, virtually, to absent friends and family. And indeed that is who won. My niece Robyn swooped in with Sweden from distant Milton Keynes. Not that she knew too much about it. “Robyn, you’ve got Sweden, you’ve won!” explained Sharon down the Blackberry to her bemused daughter. “Oh, great. Is it a good song?” I know... hard to believe she wasn’t glued to the coverage. "Will someone come in this photo with me...?" 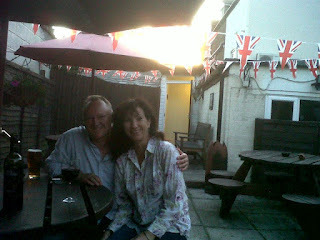 Bex and GC joined us for the barbie and we had a revelrous afternoon. The highlight of which was undoubtedly Granny trying her hand at the now-infamous Vinopolis-inspired wine tasting slurp. Her take on this technique involved a dipping head action, pursed lips and the imparting of a low-pitched hum. We looked at each other, but yes, the melodious rumble was absolutely coming from Granny. Her pale blue eyes staring at some imprecise point in the middle distance. Unshakeable concentration. Humming may not necessarily be a skill advocated in the Sommelier’s Handbook, but could it have been working? Oh no, there went the riotous laughter. Finca Labarca everywhere. All too soon, Sue’s short week was over. We’d had a blast. Her departure seemed to herald the build up to the next leg of a festival double header: the Queen’s Diamond Jubilee. Just as the pictures of Englebert came down (did anyone check to see if he was OK on the Sunday morning? 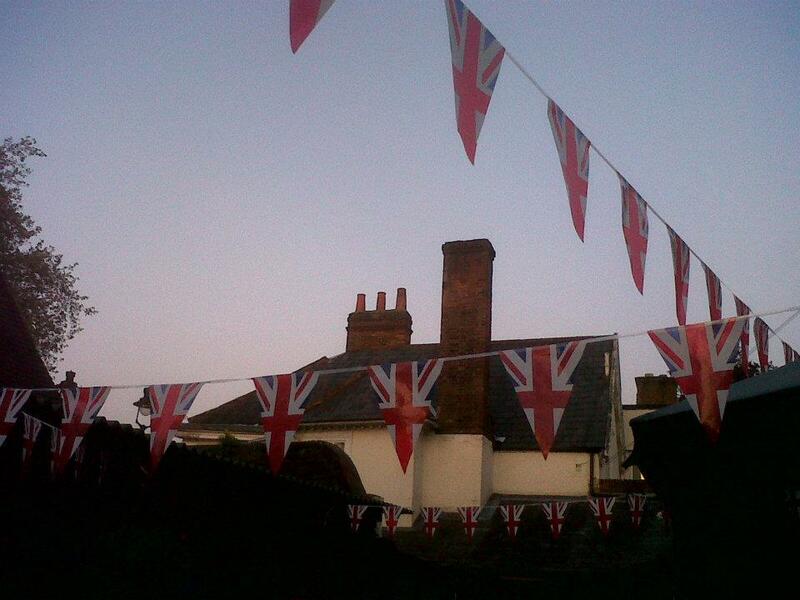 ), so the bunting went up. I’m not sure where I sit on the monarchy debate. I’m no hardened Royalist by a long stretch and I’m not about to justify fawning, jobs-for-the-boys, upper class hangers-on. But neither can I deny that the old girl has shown a fair degree of pluck and longevity in a tricky old job. And if the Rest of the World continues to come and gawp, bringing their tourist dollars with them, then I’m not about scream ‘revolution’. And I like a party too. This one did go on a bit long though: Derby procession, pageant, procession, gig, procession, church service, procession, dinner. Nice to see the Beeb got some hammer for their coverage. The bits I saw were indeed simpering, inane and shallow. The Derby was a proper procession, though. Odds-on shot, Camelot, fittingly in the presence of the nation’s premier castle owner, smashed up a small field. The O’Brien’s are the first father and son combination to train and ride the Derby winner. The Triple Crown, in Jubilee Year, is very much on the agenda, it seems. I watched these events fairly dispassionately, having only minimal betting interest. Unlike the previous day’s Oaks, where I was screaming “foul” at the telly in my most wronged tones. My outside fancy Coquet was simply murdered on the inside rail by the slowing horses Nayarra and Twirl. She was closing with a well-timed burst, brim full of running when she had the door slammed and bolted in her face. No surprise to me that once again O’Brien’s pacemakers changed the face of the race by interfering with other runners. Coquet was absolutely going as well as anything and I will not hear of arguments to suggest this under-rated filly would not at least have made the frame. Or those that say that half a dozen live chances suffered a similar fate. Which of course is true. Our Jubalympic Street Party was held on the Sunday. Bad choice. It tipped it down all afternoon. Stiff upper lips and resolve in the face of adversity were on full display. The alcohol helped too. 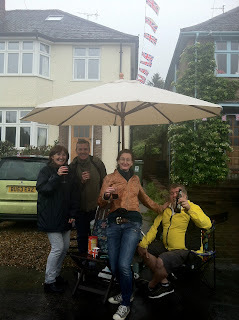 Even in the morning, as we were setting up gazebos in the drizzle, we had remained optimistic. “If it stays like this it will be fine”, we cajoled. Funny things, gazebos. Why are they all put together differently? We had about 10 to do. Which is a lot of fun when all the instructions are all missing. Especially when my neighbour’s canopy seemed to be a different size to the framework. Never mind. It may have taken eight of us, but by God, we got it to fit. (Taking it down was like pinging a giant elastic band down the road). By the time we admitted defeat in the early evening, it had indeed been a thoroughly enjoyable British affair. 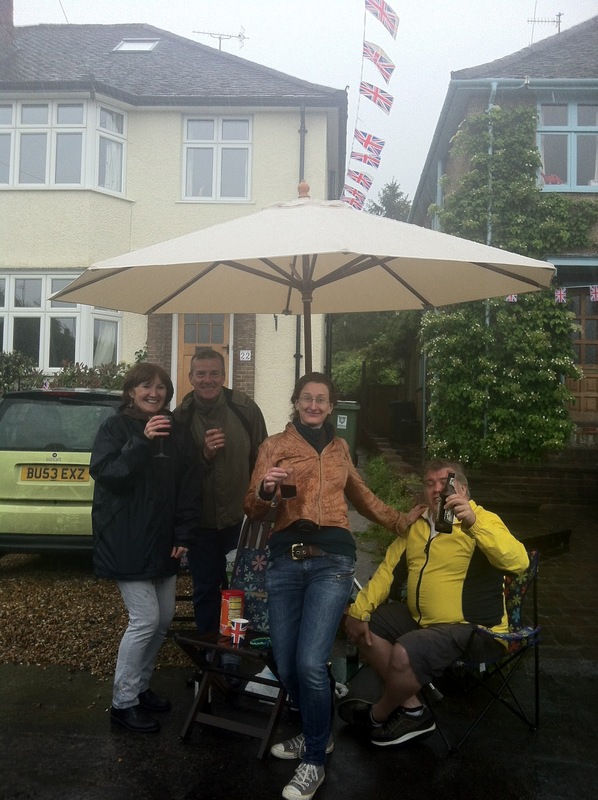 Chatting to neighbours whom we don’t see from one month to the next, grooving to a jazz band in the rain, wanging the wet welly, scoffing damp burgers, awarding prizes to soggy cakes and watching spluttery fireworks. We retired to the neighbours’ for red wine and warming Bolognese until we were absolutely sure we had properly celebrated every one of those 60 years.